Yesterday was a wonderful day all around. The weather broke above zero for the first time all week- and actually made it to +22 degrees! 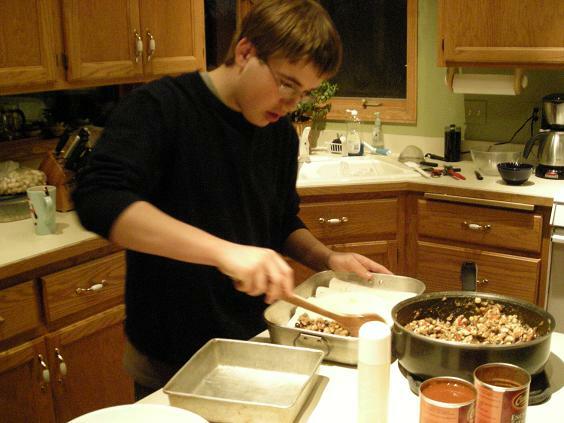 !- and my guys took over the kitchen to make tasty treats and an amazing dinner. 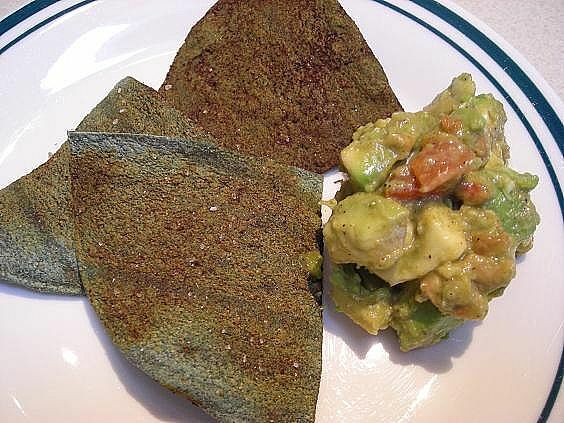 First Mike made Chili Lime baked tortilla chips, a recipe he found in the current Eating Well magazine. It’s simple to prepare which is exactly what he likes. Mix the juice of half a lime with 1/2 t. chili powder. Spray tortillas with oil on both sides, then brush tortillas on one side with the chili-lime mix. Place on cookie sheet and sprinkle with sea salt. Bake them until crispy at 375 degrees. Then enjoy them any way you want. We had fresh guacamole on hand from our Friday Night Nachos. 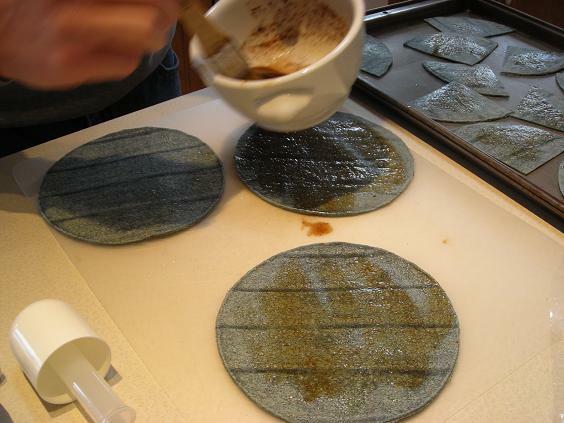 These are blue corn tortillas we had on hand. Use any soft tortilla type you wish. They are not burnt, as Griffin observed; that’s the chili-lime mix coloring the chip brown. They were fresh, crispy and just tart enough from the lime. And for dinner, Griffin wanted his favorite Chicken Enchiladas. He’s made this dish for us before so I settled down in the kitchen to observe and direct. I really didn’t need to do much more. This guy is a chip off the block, I’ll tell you! Enchiladas don’t really photograph that well, especially in winter light so there’s no finished product picture to show you. They were stellar, however. And Griffin was really proud of the effort and the result. We were too. I’ve been trying to get him to take over cooking more often. I guess I just need to motivate him with the right meals. Saute onion and pepper in skillet until soft, add garlic and cook, stirring for about a minute. Remove to bowl and stir in hominy. Add chicken to pan and cook, stirring, until pink is gone, about 3-5 minutes. Add vegetables back to pan and half of one of the cans of sauce, stir to mix all together. Cook for about 5 minutes. Spray a 9×13 pan with cooking spray. 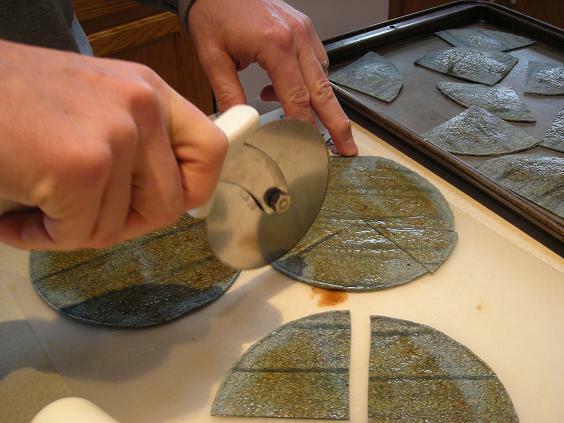 Lay one tortilla in pan and scoop about 3/4 c. of filling into center. Top with a sprinkle of shredded cheese. Roll up so seam side is down. 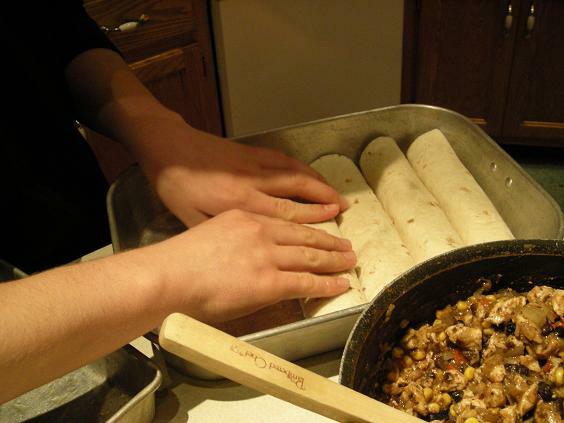 Repeat until pan is full- ours hold six, and we use an 8×8 pan to hold three more. That’s about the extent of our filling. Pour enchilada sauce over top and cover with cheese. Bake at 400 degrees for about 15 minutes or until cheese is melted and sauce bubbly. I added a shredded zucchini to the vegetable mix once it was added back to the pan with the chicken. This recipe is fine meat-less as well, and the vegetables can be substituted with others if you wish. I have also done this recipe with just beans, brown rice and vegetables with excellent results. Great looking food! I love the idea of making flavored chips at home. Ooh – these look fantastic! 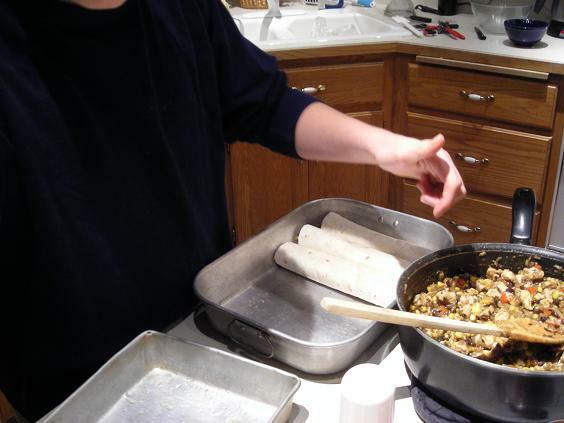 My husband loves my enchiladas but I’ve never added hominy or black beans to them and I’ve always used corn tortillas. I can’t wait to try these. Thanks! Do you hire your boys out? Having your kid make dinner for you has to be such a treat! Ooh, those lime chili chips sound like a new way to dress up chips, especially for social gatherings! I love it when restaurants add a bit of lime to their chips, they’re so lip-puckeringly good. However, I don’t care much for the “hint of lime” bagged chips. Weird, I know… maybe too artificial tasting for me? Guys in the kitchen? Now you’re talkin’! 🙂 I love blue corn tortilla chips, I don’t know why but I find them so much tastier than the yellow ones! oh, don’t you just love it when the men cook? My latest post, too! And everything they are making looks really really good! Great twists to the classics – next time – can I get an invite – lol? I recently started a cooking/baking blog as well – check it out if you get a chance. I love to experiment and try new things – let me know what you think!